A custom web address your customers will remember. And of course, the free features that make WordPress.com the choice for so many businesses and bloggers — the security, unlimited bandwidth, one-click integration with social networks, and mobile apps — are part of the deal, too. Want to change up the look of your site? 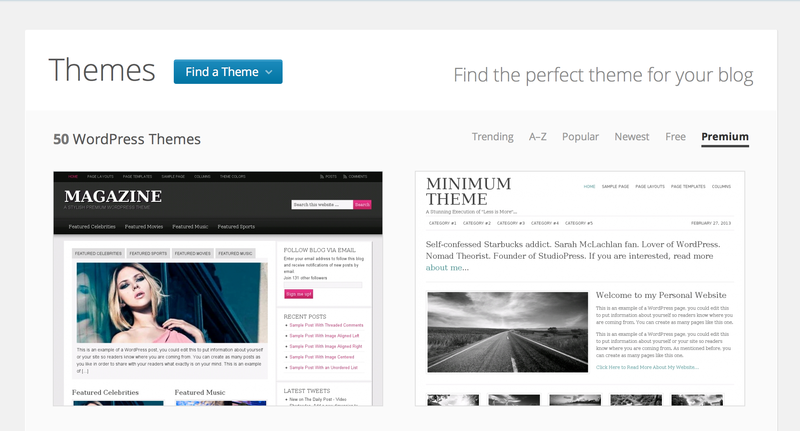 Try a premium theme or two (try four or five, and you’ve already made up the cost of WordPress.com Business). Trying to build a brand? Use Custom Design to match colors and fonts. Need a little hand-holding? A Happiness Engineer will walk you through whatever you don’t know. With premium themes starting at $50/each and our largest storage upgrade coming in at $290/year, WordPress.com Business starts saving you money from the moment you sign up. And anyone who’s ever had a website crisis knows that expert live support is priceless. At $299/year, WordPress.com Business saves you much more in developer, designer, and support costs, making it a great choice for your business and your bottom line. Start with choosing a theme — our favorite part — and then use Custom Design to tweak it to your needs. Upload your logo. Change the colors and fonts. Get your hands dirty by tweaking the CSS. You have unlimited choice from our collection of free and premium themes, which include themes designed for specific users like restaurants, musicians, or magazines as well as elegant, flexible themes suitable for a variety of sites. Try one premium theme, or try them all. All our current premium themes and every premium theme we will ever launch will be available to you for no extra cost, and you can switch between them at will. If you’re setting up a new online journal, try Mimbo Pro or Further; both include a rich home page and advanced customization options to help organize your publications. Use our Soundcheck theme for your wedding band and upload videos of your gigs, or show off your restaurant’s new seasonal menu with Confit. Setting up an online portfolio? Check out Blocco or Shelf, each with its own unique approach to showcasing your work. None of the above? Highly configurable Oxygen can create a site to support any kind of organization. Next up, add your own web address: one domain is included with the purchase, so you can extend your brand even further (you can also use an existing domain and point it to your new WordPress.com site). Now you can import content from your other sites, upload all your images and videos — with unlimited storage, you can have all the promos, testimonials, or demonstrations your customers can handle — or start chatting with a Happiness Engineer in real time with any questions. We’re just getting started with live support on WordPress.com, and we will be experimenting with both text chat and voice. For now, our focus is on offering you text chat during US business hours (EST). We’ll be collecting your feedback on how we can improve and expand live support as the service evolves. If you’re starting or growing a small business, you know how important it is to have a great website — and you don’t have money or time to waste. With WordPress.com Business, you get all the tools you need to build a rich, engaging website that supports your goals without having to hire a web developer (or turn yourself into one). We’ll worry about backups and bandwidth; you worry about your business. Headed to SxSW this week? So are we — don’t be a stranger! Wow. Thanks. This hits the spot! Ads can be shown on WordPress.com using our WordAds network. This is what I’ve been waiting for! I’ve already got upgrades on a couple sites so I look forward to hearing about getting the new business package. Cheers! Awesome! Thanks. I’ll have to keep this in mind when things start to pick up. Is there an ecommerce plugin or method? Hi Ran, thanks for the article. When you say “ecommerce is not supported by WordPress.com”, does this mean I cannot accept payment for services or products for my business via a business website I might want to create through you? Please clarify as this will help me determine if WP.com is the way to go for my business. I mean that we don’t currently support setting up a shopping cart, but you can definitely promote and market your products. At $25/month, this is a really good deal and I love the live support, unlimited storage and premium themes. I love the option of trying on multiple premium themes! What is the maximum size photos I can feature. Would someone be able to download my full resolution photo? Any options for those who want to sell photos? The maximum size is limited by the theme you pick – a theme that shows images only 200 pixels wide will only display at 200 px wide. You should be able to upload images as large as you wish. If you made these available to your viewers, they would be able to download the entire image. You are able to sell your own photos from your WordPress.com site! I like this! it’s perfect .